Meyer Lemon, Lime, & "Graham Cracker" Gluten-free Parfaits. 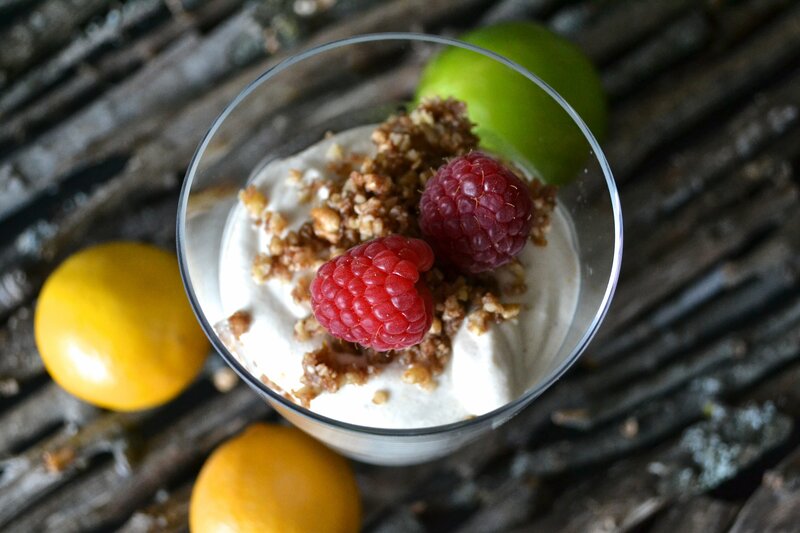 Meyer Lemon, Lime, & "Graham Cracker" Gluten-free Parfaits. I had no idea what I was going to do with the two bags of Meyer lemons I picked up on a recent grocery run – but I couldn’t resist them. Bright yellow and shiny, I’d never tried one, never even seen them before. Meyer lemon is a citrus fruit that is a cross between mandarin orange and lemon. They’re smaller and rounder than regular lemons and have a wonderful spicy smell. Right after my purchase I heard about the So Delicious 3 Course Recipe Contest and an idea was born: a creamy, tart-sweet, crunchy parfait with Meyer lemon juice as the star – and a bit of lime as character actor. A creamy, tart-sweet, crunchy vegan, gluten-free parfait with Meyer lemon juice as the star – and a bit of lime as character actor. In a blender, combine the cashews, dates, coconut milk, lemon & lime juice, yogurt, tofu (if using), maple syrup and zest. Process until very smooth. In a food processor, combine the pecans, sesame seeds, dates, maple syrup, and cinnamon. Process until crumbly and of uniform size. Put 1 heaping tablespoon of pecan mixture at the bottom of each of 6 bowls or glasses. Top with about 3 tablespoons of lemon mixture. Continue alternating layers of pecan mixture with the lemon mixture until you’ve used up both. Top with fresh fruit and additional zest, if desired. Looks so delicious and colorful Annie! I love that you used pecans (my favorite nut) and love all the citrus flavors… Oh man that sounds good. I can’t remember which blog I was reading recently, but they were talking about how amazing Meyer lemons were too, I need to get my hands on some!! I’m not sure how I missed Meyer lemons for all of these years… Definitely get some if you can. I know you’ll come up with some very yummy eats! I’m a HUGE fan of Meyer lemons, but I’m lucky to live in California where they are a very common backyard lemon tree (though I can’t say I’ve ever seen them in a supermarket). My grandmother had a big Meyer lemon tree in her back yard, and when we’d go to visit her, we would always go out and pick lemons… in their climate, it produced lemons year round! To this day I always think of her when I use a Meyer lemon—they have a lovely and unique lemon flavor and fragrance! Thanks for the great inspiration to make a parfait! We still have limes on our tree, and I’ll see if I can track down some lemons from a friend. 🙂 Thanks! Common in the backyard, eh? How lucky you are! What a nice memory, too. Thanks, Heather! That looks fearsomely tempting and my mouth’s watering looking at those lemons.You quite often use pre-soaked cashews and dates, do you always have some on the go so that they’re ready to use when you need them? The last unusual or exotic fruit I ate was a banana. Not unusual perhaps, but I’d say they’re exotic since we can’t grow them here and it’s not that long ago that they were completely unknown to Brits. Can you tell I’m a big fan of puddings?? I always have bags of cashew pieces and loads of dates. A few hours soak is about all they need so as long as I get them going in the morning, I’m good for a little dessert after lunch ;-). Interesting about bananas – I was thinking about that the other day, actually. They are ubiquitous here, but it must have been quite something when the first ones started appearing. They certainly look exotic and unusual. OOoh waw, what georgous Vegan parfaits! I want one or two right now, as a nice breakfast please! Beautifully presented too! Thanks, lady! Appreciate it – and yes! Breakfast is a great idea! Or a Nice healthy treat for brunch!!. This sounds wonderful Annie! Really fresh and I LOVE your graham cracker substitute idea. Thank you! I actually made “real” graham crackers to use, but decided to go with something easier and raw. The way I see it – it’s really just about crunch and cinnamon! Crunch is important – but frankly this sounds yummier to me than graham cracker anyway, but I am a total sucker for pecans. I know what you mean – the tartness, juiciness of citrus – seems so appealing in the winter. Maybe cuz we wish we were on the beach sipping a cool drink ;-)?! How interesting that the Meyer lemons with which you are familiar are big! The ones I have are tiny little things – cute as bugs. They’re so cute in your photos! I think my mom might just have a large variety? Either that or she feeds it lots of good compost! Divine! You had me at Meyer Lemon (and gluten-free)! Ha! I hooked you in ;-)! Ground cherries? They sound exotic to me – – and I can’t blame your chooks 🙂 for chowing down on them! Here’s to your Meyer lemon tree growing in leaps and bounds! Drooling here! We don’t get Meyer Lemons here sadly and England isn’t exactly tropical so I try not to treat myself to too much imported exotic fruit. I’ve been wanting to try coconut yogurt for ages and a lovely parfait like this would be the perfect way to use it. My market doesn’t carry much in the way of exotic fruit, either – which is one of the reasons I grabbed 2 bags of Meyer lemons! Ohh this looks so good. These look amazing… no grocery store near me carries meyer lemons… but I wonder if I used a cross between mandarin orange and lemon juice/zest if it would be similar? I’ll have to try it. I’m sure that would be delicious – or just use straight up lemon. This sounds delicious and your photos are gorgeous! These sound wonderful! And if I don’t use the optional soy, I can totally eat them! YUM. And the last exotic fruit I ate was a mango. More yum! Yay! I made something you can eat! I tried Meyer lemons for the first time last year and absolutely adored them! I love the thought of making the parfaits with them and the “faux” graham crackers crumbles. It all sounds incredible! Oh yum! I have never tried Meyer lemons. I always see them in the grocery store but always end up being to intimidated to try them. The pecan mixture looks awesome- I love doing things like that for a quick granola 🙂 Good luck in the contest lady! This looks so incredible! YUMMM! I wanted to let you know that I nominated you for the versatile blogger award. SWEET :-)! Thank you so much! Wow, Annie, this looks so creamy delicious! This looks fabulous Annie, thanks for sharing it on Healthy Vegan Fridays! I’ve just recently seen Meyer lemons return to the store, I must get some! This looks delicious! Will definitely make this soon 🙂 What kind of dates did you use? Hi Katie – thank you! I used big ol’ Medjool dates – but I think any type would work. Pingback: Dairy-Free 3-Course Contest Round-Up: Over 175 Recipes!